If you’re looking for a way to share your enthusiasm for recreational boating and time on the water while helping others, many worthy organizations would love to have you as a volunteer. Serving with a boating-oriented organization is also a great way for people who’ve given up their boats, for whatever reason, to remain involved. One of the joys of writing this column is discovering so many outstanding people and charitable organizations. Their direct focus and geographic operations vary, but one thing these organizations have in common: all depend on volunteer power and need your help. While space limits the number of great organizations listed, please look up and explore other local groups in your community. Most boaters, who have taken a boating safety class, are familiar with these two long-established and volunteer-based organizations. The U.S. Coast Guard Auxiliary and U.S. Power Squadrons both focus on boating safety, education and vessel safety inspections. The USCGA also does operational patrols to promote safety on the waters backing up the USCG, while USPS offers a wide array of advanced boater education seminars geared to both sailors and powerboat owners. Near and dear to my heart, as a boater and former museum director, are the wonderful maritime museums we enjoy in California. Many operate, preserve and maintain historic or replica vessels so the public can experience “life before the mast” on a restored or recreated historic vessel while also presenting exhibitions documenting the maritime life throughout our history. Most members of the “sail crews” and maintenance teams are volunteers. Among museums exhibiting ships is the Maritime Museum of San Diego, which last year completed construction of the Spanish galleon San Salvador, built with mostly volunteer labor. The San Pedro-based Los Angeles Maritime Museum uses volunteer crew and captains on their World War II-era tugboat. Meanwhile Los Angeles Maritime Institute offers sailing experiences for at-risk youth on the Irving and Exy Johnson brigantines, along with traditional exhibits and other programs. Finally the Santa Barbara Maritime Museum provides crewing opportunities on their sportfishing yacht Ranger. Many single-vessel-based organizations, including the Schooner Bill of Rights, USS Midway Museum and SS Lane Victory, lighthouses and other maritime-related museums are listed at maritimemuseums.net/CA.html. Each is always in need of volunteers. 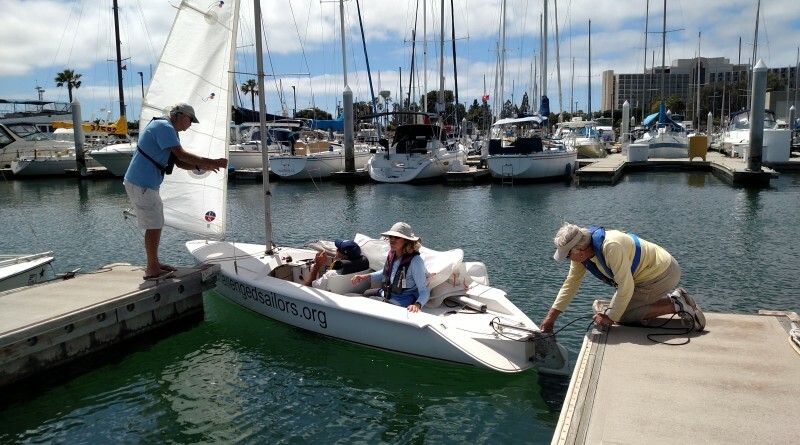 Helping the disabled learn to sail is the focus of San Diego-based Challenged Sailors. The all-volunteer group uses a fleet of specially designed Martin 16s to enable people with widely ranging disabilities rediscover a sense of freedom through adaptive sailing. Each participant is paired with a volunteer assistant in a program everyone finds satisfying and exhilarating. No sailing experience is needed to volunteer. Disabled Sports USA has local chapters throughout California, including L.A.-based Wheels to Water, which helps wheelchair users explore the outdoors through kayaking. Reducing ocean pollution and educating boaters about clean boating practices is one focus of the Los Angeles-based Bay Foundation, which offers many clean water-oriented programs from Santa Barbara to San Diego, including the Dockwalker program. This trains volunteers to walk the docks to educate boaters about clean and green boating practices. Los Angeles-based Heal the Bay Foundation organizes beach clean-ups and issues beach health report cards, while I Love a Clean San Diego stages beach and community cleanups throughout San Diego. The Surfrider Foundation, with local chapters throughout U.S. coastal communities and especially in California, focuses its work on activism and advocacy to protect the oceans, coast and beaches from environmental threats. Whatever your interests, there’s a volunteer organization eager for your help.